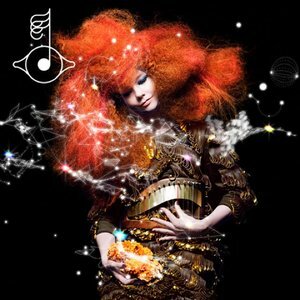 It’s hard to even explain the “what” of Björk’s eighth album, Biophilia, much less the “how.” An entire article could be devoted to exploring and explaining the process by which the album was created, the collaborations with National Geographic and Apple and David Attenborough, the creation and inclusion of “gravity harps,” the release of the album as not a piece of music but as a part of an experiential interactive semi-educational “project” to be released as a collection of iPad and iPhone apps, and on and on and on. I won’t delve too deeply into the back-story of Biophilia, but I do encourage anyone with even a passing interest in music and technology to dig in and read all about the amazingly ambitious undertaking. Instead I will try and talk about the music as much as I can. Although I don’t know that I have the intellectual capacity or the breadth of vocabulary required to accurately illustrate what Biophilia is musically either. And I don’t know that any deconstruction of the parts, the instruments and arrangements, will help make the image of the whole any clearer. I don’t know what to say exactly. I’m out of words. I’m speechless, because I can’t quite wrap my head around the scope of what I’ve just listened too. And all my subsequent listens haven’t helped. It’s not the kind of music you can call good or bad or sum up by placing it on a relative scale born of a broad and widely understood frame of reference. It creates its own frame. Or disregards the idea of frames altogether. I don’t know. It makes me wonder what exactly music is. I think we can all agree, that in the most general sense, music is sound arranged in order to elicit emotion, but how can Biophilia exist in the same category as White Snake? How can they be considered within the same lexicon? I could spend this review reminding you that she has a beautiful voice, almost alien in its purity, but I think talking about my inability to clearly talk about this album is a more fair recreation of the experience than any pithy analogies I could come up with to explain the sound of a single song. At best I can say the music bounces across some parallel plane of sound that we simultaneously are somehow able to compute even though we cannot fully comprehend it. For all my rambling, I can say quite confidently that it is timeless. Not in the traditional Rolling Stones way, but in the way that it escapes any temporal context. Biophilia doesn’t represent today or tomorrow; it doesn’t reflect the edges of the norm in an expansive mirror that explores their oft-ignored details. It’s from somewhere else. It is, truly, of the else. Exactly what that means I’m not sure, but it sure is fun to think about. I guess that’s probably the best assessment I could give Biophilia. More than anything else, it makes you think.